On April 20th 1917 the Calomba Railway Station shared in the official celebrations for the new railway line from Salisbury to Long Plains. At Long Plains his Excellency the Governor of South Australia Sir Henry Galway performed the opening ceremony by starting the train in readiness to travel to the next station. 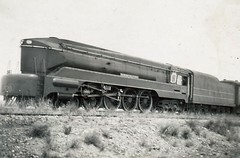 With the official passengers on board the train moved along the new Adelaide Plains line through the stations of Calomba, Mallala, Korunye, Two Wells, Virginia, Direk, to Salisbury. It would be another five years before the extension of the line through Avon and Kallora reached the Bowmans junction in 1922 with an official opening ceremony there on 28th May 1923. In the area known as Shannon, South Australia, the people of the community had built the Shannon Methodist Church and adjoining cemetery in 1873. The children of the area attended either the Stony Point School or the Long Plains School. Following the decision on the route through the Shannon area, farming land was purchased on which to build the main line, a spur line, station building and land for wheat and barley stacks. The South Australian Railway Commission named the station Calomba as there was already an area named Shannon elsewhere in the state. It was a reliable grain growing district and in a good year up to 30,000 bags of grain were built into stacks in the Calomba Railway Yard. Gradually many grain storage sheds were built in the yard by the agents from different firms e.g. Farmers Union, Thomas' of Port Adelaide, S.A. Railway grain shed. This meant seasonal work for many men who were employed over the years as lumpers. The wagons (or later trucks) would be lined up at the stacks, the farmer would unload the bags of grain one at a time onto scales which were set on a platform. The wheat agent would weigh it and an assistant would record the weight against the owner's name. A lumper would then shift the bag of grain by laying it over his shoulder, carrying it to the stack and placing it in the required position. Men prided themselves on building a good stack with a strong foundation, square corners and straight walls. In the very early years a wide timber plank enabled the men to walk up the plank with the bag of grain on their shoulder as the stack was built higher. Eventually East Bros built a long elevator to be used at the railway stacks. This made the job much easier with the bags being pushed onto the elevator and the lumpers waiting for them at the top of the stack. 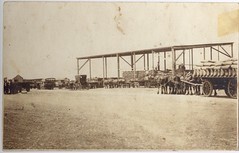 In later years after the installation of a weigh bridge the total truck load was weighed and the tonnage (less the tare) was recorded to the owner. It was Messrs Jack Howard and Tony Howard who decided to install a weigh bridge at the Calomba rail yard. In 1918 Mr Sydney Dean Roberts purchased Part Section 135 Hundred of Dublin from John Barrett and established a wheat agency at the Calomba Railway Siding. The successive owners of the land combined the wheat agency with running the Calomba Store and Post Office. 1976 – The property was sold and became a private residence. 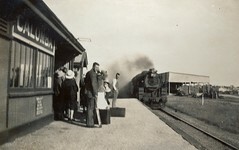 Travel by rail was very important to residents of the Calomba district and families used the service to provided transport to Adelaide for appointments, outings and shopping. The early morning Rail Car from Bowmans collected students at railway stations and cross roads along the route to take them to Adelaide for their secondary education and later for employment. 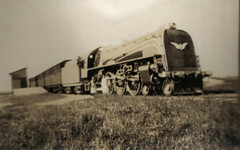 The students returned home on the 4 o'clock Barwell, and those in the work force on the evening Port Pirie train. Farmers were reliant on the goods trains to deliver items such as fencing material, wool packs, parts for implements and countless other farm requirements. Also it was convenient to dispatch by goods trains bales of wool, skins, cans of cream and boxes of eggs to the appropriate firms in Adelaide. 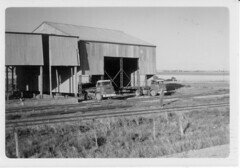 When bulk handling silos and facilities became available at the Mallala and Long Plains Rail yards in 1957 the manual handling of bagged grain was gradually phased out at these locations and at Calomba. 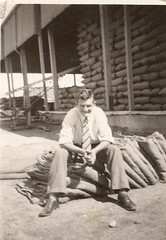 Ira Jenkin was the last wheat agent at Calomba in the final year of the Howard's ownership of the shop and post office and agency. When the weigh bridge was no longer required at the Calomba rail siding, Ira purchased it and removed the weighbridge to his farm for use in his trucking business. 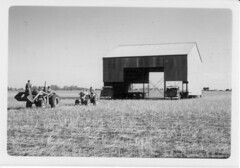 In 1967 Ira Jenkin, a carrier and farmer of Calomba, purchased a huge grain shed from the Calomba Railway siding from the owners Thomas' of Port Adelaide. Ira decided that it would be far too difficult and time consuming to dismantle the shed and then rebuild it, so the decision was made to move the shed intact to his farm. He planned the operation thoroughly and first removed the mouse proofing from around the base thus exposing the posts. Ira and helpers then jacked the huge structure up onto the back of two semi trailers and hooked two tractors out the front to pull the ungainly load. He strung a length of wire cable between the trucks, tied some material in the centre and instructed the truck drivers to keep the cable tight or they would be in big trouble!! Unbelievably the convoy travelled over the flat railway lines (with railway personnel in attendance in case of problems) across country and through paddocks for about three kilometres without the slightest mishap. (The fences had been taken down and then repaired later in the day) On arrival they dropped the posts into the already dug holes, settled the shed and had the posts cemented in by nightfall. What a good day's work! In this year 2013 the shed is still standing on the Jenkin property. In 1975 A.N.R. (Australian National Railway ) took over the South Australian Railways and when a new Standard Gauge rail line went through the district in 1982 the rail line was built up higher. In this year of 2013 there are no trains stopping at the former Calomba Railway siding, nor any station building or grain shed left to tell passing travellers that this was once the busy Calomba Railway Siding. 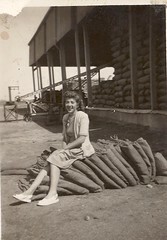 Winnie Howard at the Calomba Wheat Stacks early 1950s. Ira Jenkin moves an unused Wheat Storage shed from the Calomba Railway Siding. Mrs Maureen Parker remembers: Mrs Maureen Parker (nee Baker) recalls, " My two sisters and I have fond memories of staying at Calomba during many school holidays with Aunty Ruby Gale and Allan Gale. I was staying there during the bumper harvest of 1939 and it was all hands on deck to assist Uncle Allan at the Wheat Stacks. It was my job to enter in a book the weight of each bag as Uncle called it out. It was then the lumper's job to shift all bags of grain to the stack." Manning states: Calomba - A railway station 10 km north-west of Mallala is said to be an Aboriginal name for the Australian Shamrock. Mrs Winnie Howard recalls the stock yards that were at the Calomba rail siding. The farmers would bring their sheep and cattle to the yards during the day and they would be loaded on the goods train at night to be taken to the Gepps Cross abattoirs for sale. Winnie said that the banging of the trucks and noise of the cattle would keep her awake at night when she was newly married. She got used to the noise after a while and could sleep through it all. Do you remember Calomba Railway Services ? Then Join up and add your memory here.